I have to ask: Isn’t the point of buying music online not having to go to the store? As expected, Sony BMG will begin selling DRM-free music, but in an odd, online-offline, hybrid manner. On Jan. 15, Sony BMG will begin selling MP3s without copy protection, but here’s the rub. Consumers must go to a bricks-and-mortar retail store like Best Buy or Target to buy a Platinum MusicPass card. The card contains a scratch-off unique PIN — not unlike ones used by iTunes and other online services — that will unlock the chosen album for download at musicpass.com. 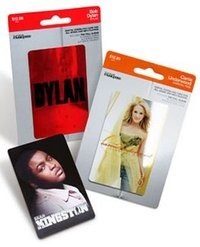 The MusicPass cards will retail for $12.99, while an “expanded” card will sell for $19.99 and include an additional album from the artist’s back catalog. Contrast the Sony approach with AmazonMP3 and iTunes. AmazonMP3, which recently landed music from Warner Music Group and Universal Music Group to go along with the EMI catalog already available, offers 2.9 million DRM-free in the MP3 format. iTunes, the leading online music store, offers around 2 million DRM-free tracks in the AAC format supported by the iPod. No need to burn gas to run up to the store to buy music, unless you can’t live without Britney’s latest. As we shake our collective heads, we must remember that Sony is Sony, the same company who sought to put “rootkits” on music CDs and wanted to overthrow MP3s with its proprietary ATRAC format, which died right along with Sony’s mini-disc players. Yet — we’re being positive here — Sony’s online-offline strategy and the death of ATRAC are signs, an ever so faint, that the company is easing away from DRM and waking up to the music world around them. Even so, it’s interesting to see that albums purchased with the Platinum MusicPass card will be “anonymously watermarked,” meaning the watermark cannot be used to identify users or where the music was purchased, Sony says. The watermark will help the label understand whether the songs are being shared on peer-to-peer networks. Speaking of peer-to-peer, the infamous Napster announced it will start selling music downloads as unprotected MP3 files this spring. The change only applies to single track and album purchases and is not a part of Napster’s music subscription service, which will continue to have copyright protection. Not many details were given by Napster, but it looks as though the unprotected downloads are available to Napster subscribers only. No word on price or which labels will offer the DRM-free tracks. Selling DRM-free downloads to subscribers is yet another attempt by Napster, the bad boy that started the digital download revolution, to reinvent itself for the 100th time. As an online music subscription service, Napster is one of the leaders. As a digital download-to-purchase store, Napster lags far behind iTunes. I envision this catching on…all artists on all labels becoming available and displayed right beside the corresponding CD in stores, giving consumers a choice. COOL!